Are you guys sick of the brussels yet? I’m not. Clearly. 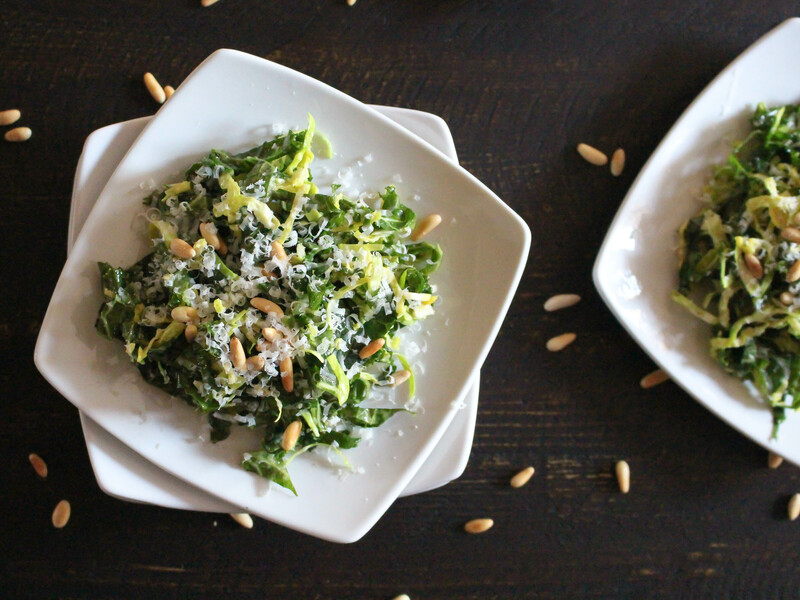 I know I JUST shared a roasted brussels recipe with you a couple days ago, but I haven’t gotten them out of my system yet…and I’m not sure I ever will or even want to. I THINK it’s safe to say that currently they are my favorite veggie on earth. My 10-year-old self would never believe it. Despite my obsession, I had never tried a raw version of brussels. The idea kinda scared me because I had only ever had them roasted, sautéed, in a fluffy and cheesy quiche, or tossed with bacon. Which is a veggie cheat, really. After all, anything tastes good doused in butter, oil, or bacon grease! I had confidence, though, that the good ol’ b-sprout would not let me down. In keeping with the lighter theme on here as of late, I decided to make a salad out of my raw b-sprouts and to throw in some kale. 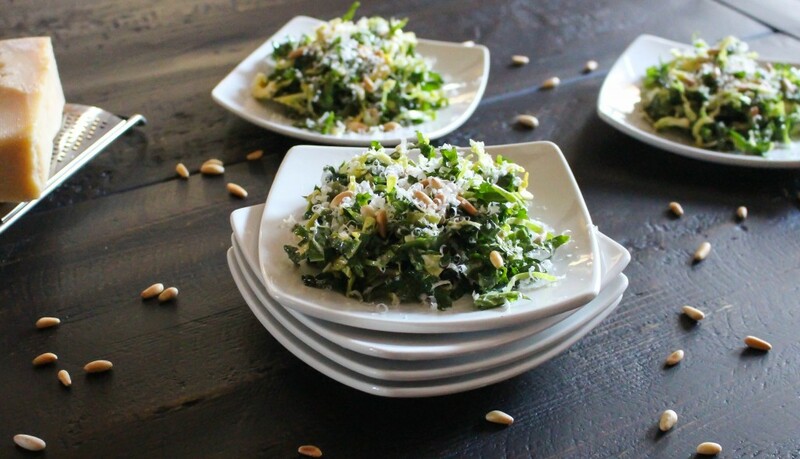 I’d seen variations of this salad all over Pinterest, and I’d heard people rave about it. So, I went for it…and I’m so glad I did. 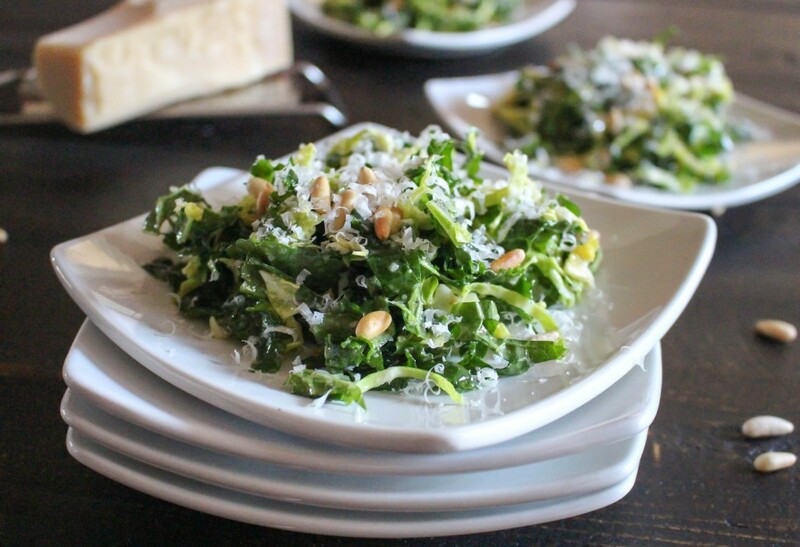 The flavors of this salad kinda remind me of a Caesar salad but with a much healthier spin. Not only is kale an obvious “duh-this-is-good-for-you” food, but the b-sprout is no slacker in the nutrition department! Just Google it. They are loaded with fiber, vitamins, antioxidants, and even protein! 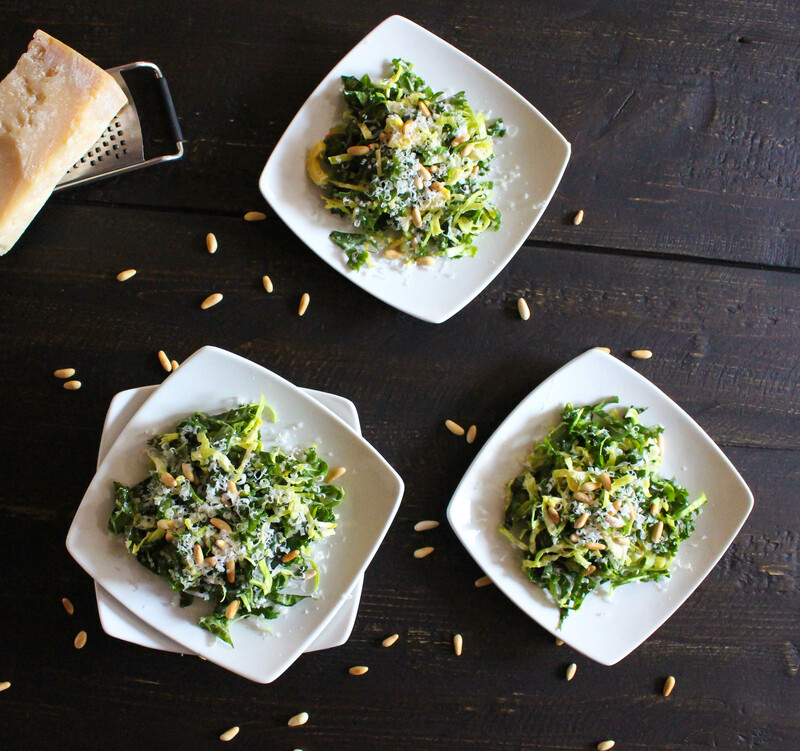 Definitely a good green veggie to keep in your rotation…especially if you can come up with fun new ways to eat them. They are a nice departure from broccoli and leafy greens. The fun thing about this salad is that the veg retains its raw crunch. Sure, that may not be for everyone, but I loved it. 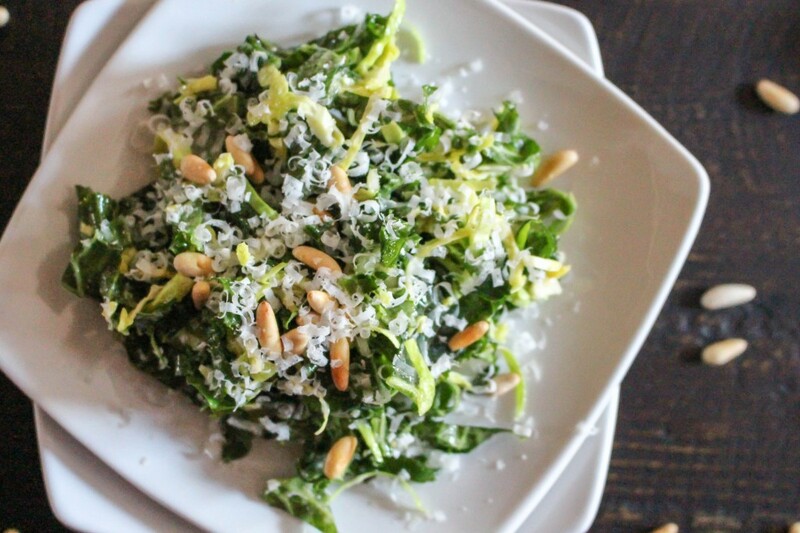 The dressing is like a punch of lemon (which you know I love) and the sharpness of the parmesan cheese and butteriness of the pine nuts round everything out. Love it. Best part? It comes together in no time and counts (for me) as a totally acceptable weekday dinner. 1. Using the shredding blade in a food processor, shred the brussels sprouts (or slice very thinly with a sharp knife). Roll the kale leaves up into bundles and thinly slice. Toss the two together in a large bowl. 2. Make the dressing in the food processor by blending all ingredients together and streaming in the olive oil last. I like mine pretty smooth, so I processed the heck out of it. Season, to taste, with salt and pepper. 3. Toss the brussels and kale well with the dressing and allow to sit for 15-20 minutes so that the dressing is somewhat absorbed and the vegetables have softened just slightly. 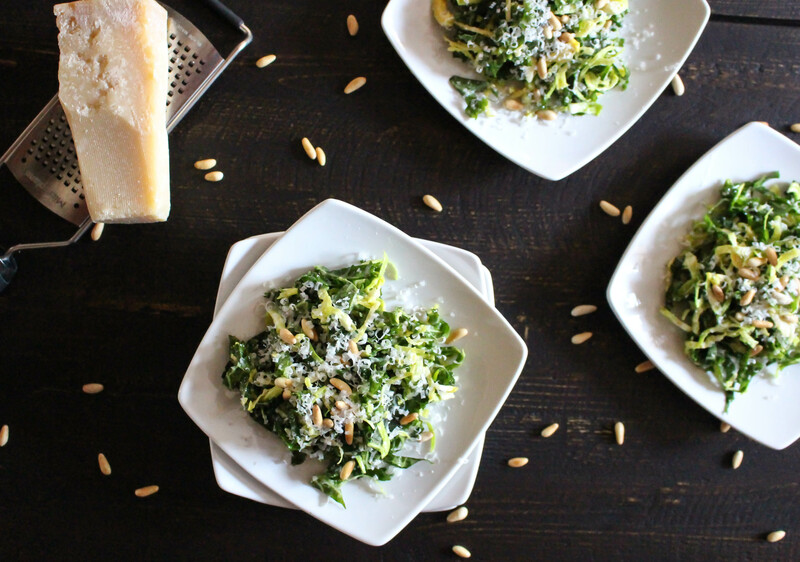 Garnish the salad with the toasted pine nuts and grated cheese. Note: I had extra dressing. It’s good on a lot of things! i’m also a big fan of brussels sprouts. this salad sounds great! Glad you liked it! I love anything lemony. Can’t wait to try this recipe. I don’t have pine nuts, wonder if walnuts would work? Absolutely! I think walnuts would be delicious in this. So would almonds. Thanks for stopping by! Thanks, will make this tomorrow.